Play Jester Spins Slot Online with 500 Free Spins! Jester Spins is a UK Online Slot Game by Red Tiger. This 3-reels, 5-betways game has an RTP of 96.19%. Main game features are FreeSpins and Multiplier. There is no joking around in Jester Spins UK slot game with many chances to win real money in an electrified environment. 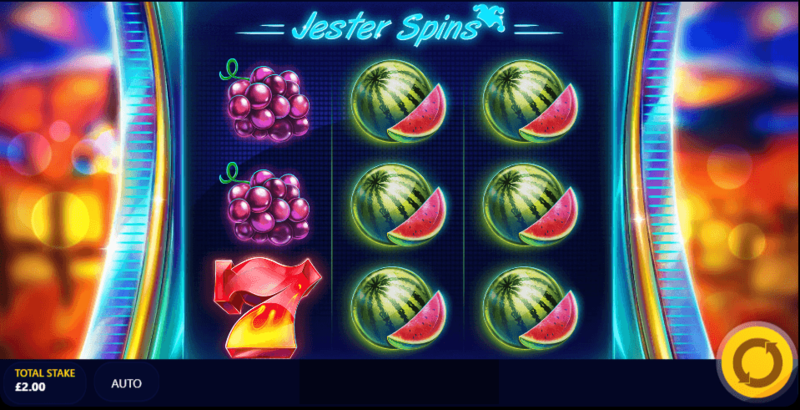 While Jester Spins slot game has a classic fruit slot quality, from the symbols to the simple style, there is definitely a modern upgrade that is full of excitement. The reels themselves appear to be set against a lively and lit up jukebox although, on closer look, this seems to be an actual slot machine. In the backdrop are blurred bright lights of orange, yellow, and blue that dazzle and enhance the sharpness of the actual reels. High to medium value symbols include retro favourites of lucky red 7s, gold stars, and a golden bell. While there is no Wild symbol, there is a Jester Scatter Bonus symbol. Of lower value is a fresh looking fruit salad of a watermelon, a bunch of grapes, a plum, and cherries. The graphics of Jester Spins online slot especially impress with vibrant and colourful illustrations. There are also electric style animations with thrill flashes and beams of light that fully immerse you into a magical environment. The symbols also slightly expand in size whenever they form winning combinations. Upon spins there is also a catchy and popish digital style background music. In fact, the tune is somewhat reminiscent of 1980s dance with an electronic undertone. This blends nicely with the chimes and upbeat sound effects for any winning combinations. Even the fruit on the actual slot has been seen dancing 1980s choreography over to Rose Slots, where each play of the Jester Spins online reels has many exciting opportunities to enjoy generous payouts. Letting you dance with the Jester in Jester Spins slot is one of the best and most popular online casino games designer, Red Tiger Gaming. Founded in 2014 and based out of Malta, Red Tiger Gaming has among the top leading and talented developers that work with a passion to release titles that showcase amazing and immersive visuals, engaging and fun gameplay that is easy to understand, and bonus features that offer many potential generous payouts. Fans of online casino UK can find a whole range of exciting and innovative Red Tiger Gaming titles at RoseSlots.com such as ‘Dragon’s Luck Power Reels’, ‘Lucky Little Devil’, ‘Ninja Ways’, ‘Reactor’, ‘Dragon’s Fire slot game’, ‘Flaming Fox’, ‘Three Musketeers’, ‘Jingle Bells’, ‘Piggy Pirates’, ‘Totem Lightning: Power Reels slot'’, and ‘Jack In A Pot’. While ‘Jester’ may be in the title of this slot you are not expected to perform any juggling tricks or goofy acrobatics as Jester Spins online slot has a simple to pick up, engaging and fresh, and overall fun gameplay. Staying true to the retro slot quality, there are 3 reels, 3 wager rows, and 5 paylines, that may have you saying that the rewards are more than a nice ‘jester’ (or gesture). When 3 Lucky red 7s land on the reels you will have won the highest payout of 100 coins on your initial wager. 3 gold stars anywhere on the reels will have you really feeling like a superstar with a 75 coin win on your total wager. This is followed by 50 coins for 3 of the golden bell on any given spin. In terms of the juicy reward for fruit, you win for 3 of them: 30 coins for watermelons, 20 coins for the bunch of grapes, 15 coins for the purple plum, and 10 coins for cherries. However, you will want to keep the fun spinning until you trigger the thrilling Bonus Round as this gives you the chance to grab the amazing jackpot of a 500x multiplier on your total bet. The basic 3x3 grid makes gameplay is very easy as you soon learn the values for each of the symbols and can keep track of all your winning payouts. Betting in Jester Spins slot has a relatively modest range from 20p to £40. Lower wagers only increase by 20p or £2, whereas higher stakes increase by £10 or then £20. This is beneficial as players can then pinpoint a betting strategy and are not forced to make major leaps in their wagers. If all the bright looking fruit on the reels is making you feel like blending a smoothie, simply set the AutoPlay for 10 to 100 uninterrupted spins. There is also a ‘Turbo’ button for lightning fast gameplay as well as a Quick Stop by pressing the spin button again when the reels are moving. While at the futuristic disco or at the laser bowling alley, you can stay in the zone by enjoying Jester Spins online as it is nicely designed and completely formatted as a mobile slot as well as on other devices like tablet and desktop. This means you can play Jester Spins slot anywhere and at any time, which is great since it is a nice pick me up if the day is going slow. With relatively good payouts and also an exciting bonus round, the theoretical RTP or return to player for Jester Spins slot game is 96.19%. This makes the slot medium to somewhat high variance, which means that you will likely enjoy higher payouts despite wins occurring less often. Despite the basic retro quality of Jester Spins online slot, the Bonus round is full of energy and excitement. When 3 of the Jester hat symbols lands on the reels you will trigger the ‘Jester Spins Bonus feature’. You will then enjoy 10 Free Spins. The most exciting part of the Jester Spins, however, is not just the 10 Spins awarded but whenever the Jester Spins symbols appears again on the reels. When 2 Jester Spins symbols land on the reels, you will win at random up to a 50x multiplier on your total bet. When 3 Jester Spins appear on the reels, you will certainly be dancing as you could be awarded up to a 500x multiplier on your initial wager. With a jackpot payout like that, it is safe to say that you have gone from Jester to King or Queen and will be crowned ruler of the slots.